I survived my first tailgate with Blair’s family! And it was a blast. With an understanding that copious amounts of food and beer would be consumed, we hit the gym on Saturday morning to try to offset our moderate ridiculous indulgences. He ran a few miles on the treadmill and I completed a mildly challenging bootcamp. Even though I knew I needed to work hard, my motivation levels stunk. I just couldn’t push myself like I usually do. My hip flexor was being a jerk and my hamstrings were tighter than ever, and I just didn’t have the drive to push through. But I tried. 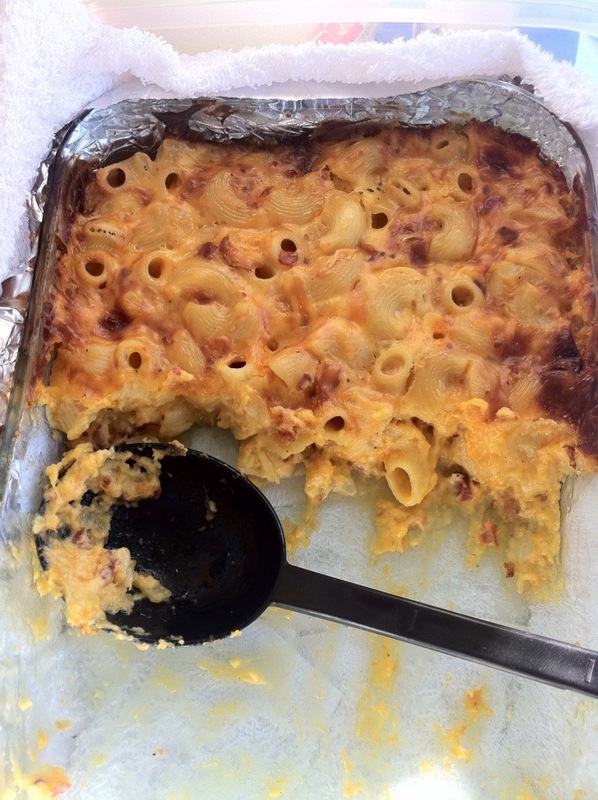 We decided to try a recipe from Taste of Home which was described as “the ultimate mac and cheese” for our tailgate contribution. We made a few small changes and doubled the recipe (which was completely unnecessary) and it truly was the ultimate mac and cheese. Along with our 2,000,000 calorie pasta side dish, we had wings, an awesome broccoli salad, fruit, cheese, and beer. These guys are tailgate veterans. With 2 boys that played college football, Blair’s parents got a lot of practice, and this was one of the best Saturday afternoons I’ve had, full of tasty food and fun! I even tolerated the football game! There was a lightning delay, so technically I only tolerated the first half of a football game. But it’s a start! Unfortunately, W&M is off to a rough start this season, at 0 and 4. I didn’t know it, but I was supposed to bring good luck last night. I failed. When we sought shelter after the lightning, the game was already pretty miserable to watch. We left early, and it didn’t get much better and they lost. But I had fun, and isn’t that all that matters?! No party is complete without dessert. I tried out a Pinterest recipe for Pumpkin Spice Latte Cupcakes that were out of this world. We even made new friends and shared cupcakes with our tailgate neighbors. 2 dozens cupcakes is too many for 6 people. Want to give your cardiovascular system a test of its health? Try this recipe. The good thing about it is that you only need a few bites to feel satisfied. It’s a special occasion treat only! Serves 6. Adapted from Taste of Home. Preheat oven to 350F. Grease 3 quart baking dish. Cook macaroni according to package directions. In a small skillet, sweat onion in olive oil on low heat, until softened. While pasta is cooking, melt butter in a large saucepan. When butter is melted, stir in flour until smooth. Slowly stir in milk and cook on medium until thick, stirring constantly (2-4 minutes). Once the bechamel (yep, you just made a fancy French sauce) has thickened, stir in Velveeta, sour cream, Parmesan, salt, pepper, and ground mustard and heat on medium until all cheese has melted. Drain pasta, pour into greased 3 quart baking dish. Toss pasta with cheddar cheese, then stir in cheese sauce, onion, and bacon. Bake uncovered for 30-45 minutes or until cheese is melted and golden brown. Go for a long run, then enjoy this indulgent creamy, cheesy goodness!